The park itself is informally landscaped with plantings of exotic species such as eucalyptus, pomegranate trees, olive trees and mimosas. For the last 10 years, the Fête des Plantes flower show has been held on the wide lawns on the second week-end in September. In addition, several sports facilities are made available to local people and schools: gymnasium, basketball, handball and tennis courts, football pitches, alleys for playing boules, etc. Opposite the château, the Tropical Greenhouses which used to be managed by the Business School have now been taken over by the Local Authority. 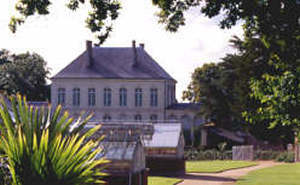 They house France's only collection of exotic commercially grown plants such as rice, cotton, coffee, cocoa, ebony, mahogany, and vetiver. In the part devoted to vegetables there are tubs of citrus trees - lemons, tangerines and grapefruit - as well as short-lived food plants such as hot peppers, asparagus peas and peanuts are on public display. The Local Authority's Gardener and nursery produce the foliage and flowering plants, trees and shrubs used to decorate public buildings and gardens.